Mr. Popper’s Penguins hits the Lincoln Center stage March 24th for two wacky, waddling, family-friendly performances. Many may recognize the title from the 2011 movie starring Jim Carrey — but these penguins have a much lengthier history than the movie lets on. Published in 1938, Mr. Popper’s Penguins was written by Richard Atwater, with later collaboration from his wife Florence as he grew too ill to complete the novel. The book has been beloved by children for 80 years, winning a John Newbery Medal, a Young Reader’s Choice award, and serving as an inaugural book for the Lewis Carroll Shelf Awards in 1958. Unlike the movie, where Jim Carrey plays a successful businessman who cares for the penguins in his New York City apartment, the original story follows an ordinary house painter, Mr. Popper, and his fascination with the South Pole. Mr. Popper writes a letter to his favorite South Pole explorer, Admiral Drake, who then sends him a gift – a penguin to call his very own. From there the expected antics begin. Soon, the Poppers open their home and hearts to a bunch of the boisterous black and white birds but the growing family puts a strain on the Popper’s budget. Mr. Popper’s solution: turn the penguins into performers and take the show on the road. Delivering what The New York Times declares, “cuteness [that] is hard to resist,” this stage version of Mr. Popper’s Penguins returns to the original story with an added bit of retro charm. 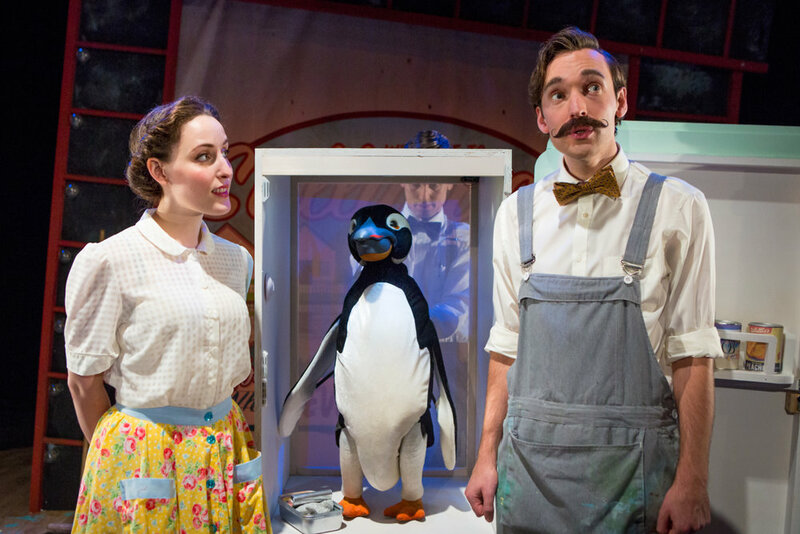 With catchy songs and penguin puppets who are expressively comical, this action-packed musical is perfect for families, particularly those with children under 9 years old. Mr. Popper’s Penguins comes to the Lincoln Center March 24 at 2 and 6 p.m. All seats $15.